Bethlehem, NH– Harley was looking for a home and a new job when Angela Jones adopted her. Jones, of Bethlehem, took in the 11-year old Huskey-mix in November 2010, after her previous owner was no longer able to keep her. Harley’s job is to make people feel comfortable– fostering a sense of calm and well-being and reducing the effect of afflictions like anxiety and high blood pressure. Today, Harley continues her free visits as an official therapy dog, though now Jones is her handler. After a few months of study and putting Harley through a test, Jones became registered with the Lakes Region chapter of Therapy Dogs International. They showed up to the exam into a gym full of other dogs. “We were on a basketball court and there was an obstacle course with items you would find in a hospital,” she said. “Food is dropped to see if the dogs will fight over it, the canines are tested to see if they are aggressive around other dogs, and Harley was tested to see if she would be anxious or misbehave while Jones was out of her presence for several minutes. Harley passes the exam with flying colors, said Jones. Harley accompanies Jones to her clinic on Cottage Street, where the dog sits in with 10-12 clients a week. Once a month, Harley volunteers at the Friendship House in Bethlehem. Jones considers herself lucky to have Harley. Although it wasn’t the reason they requested services, Jones said Harley successfully helped one adult client restore her trust of dogs after a traumatic dog bite incident as a child. “Harley always volunteers her time and always seems to know when to approach and when not,” Jones said. 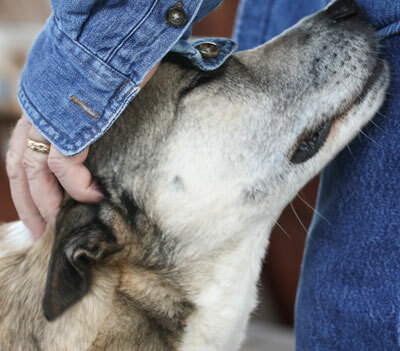 It’s that the human-animal bond that helps humans in a myriad of ways, she said. 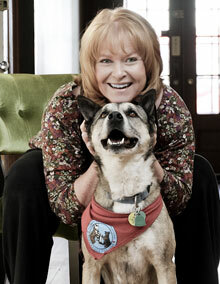 Since childhood, Jones has had a variety of pets from turtles and birds to cats and dogs. “I grew up with dogs and love dogs,” she said. Anyone wanting to meet Harley, or anyone knowing of someone who might benefit from Harley’s free threapy services, can call Jones at 603-616-2019.